We Now Have UloggersTV & TeardropsTV To Sustain Communities, Grow Steem & Prepare For The TeardropsSMT. So i may end up stepping out tomorrow. 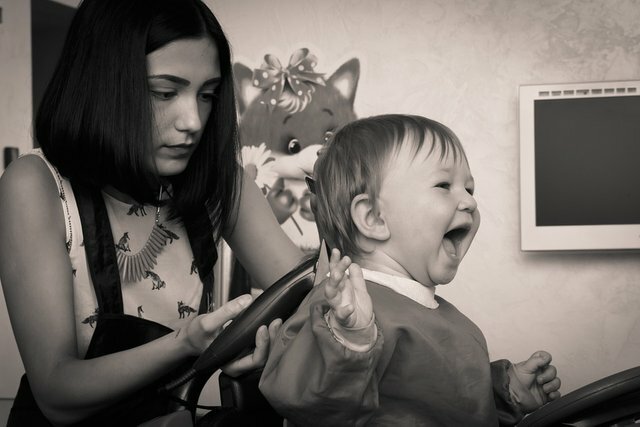 I may have a haircut too and a shave but who gives a hoot really. Not like i do either but its a push, however small and its something. Yes, i am allowing something to push me. From nothing, a steemian wants to interview me tomorrow and i am hoping this will successfully push me to step out (tomorrow). I will have to get a hair-cut finally, prepare some video devices etc and step outside into some "world". I may learn a few things too. I will have to download an app called zoom and go through with the process of a recorded conference call and i am told that this app allows a variety of stunts. In general, i am hoping to learn, from my participation in the interview as i will be carrying out more video-creation over time. Recall, that i started a YouTube channel and a page on https://surpassinggoogle.com to fill up with videos related to "steem and life success" as well as rare INTEL. I haven't continued as planned but tomorrow will spark matters or at least, i am willing to let it. My few videos as well has managed to gain some traction and inspire action and not only does this encourage me but opens my eyes to how "videos" can play a large role in my vi-mission and our vi-mission overall. I have never been good with making videos, taking shots etc but now it is something i have to learn a bit of. 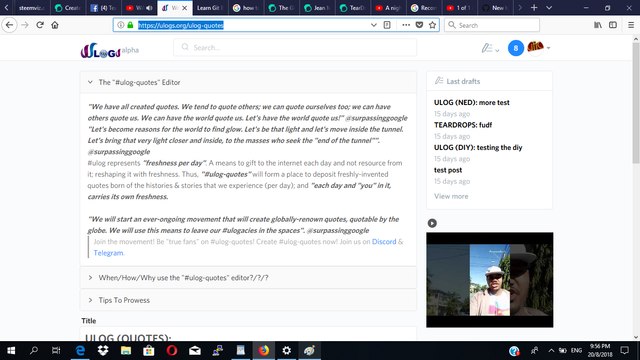 We now have TearSubsdropsTV and UloggersTV also, in preparation for the TeardropsSMT and the growth of steem through ulogs.org etc plus an entire world movement and we will need many videos. We must have established a level of excitement and buzz (courtesy of ulogs.org) internally, with the birth of #ulog-based communities across ulogs.org, putting "everyone" in the mix, by celebrating them and their dreams or attempted-dreams. That is an example showing where we are headed. 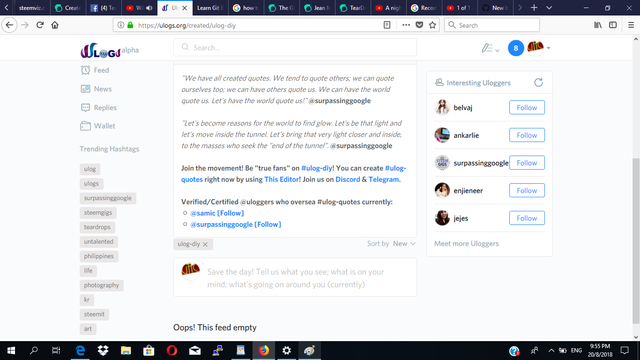 You will notice that #ulog-quotes is one ulog-based hashtag and growing community that gained traction quickly and has produced content daily and we have manage to adopt it onto the model of ulogs.org with its "specialized editor, its style-guide and it's overseas". 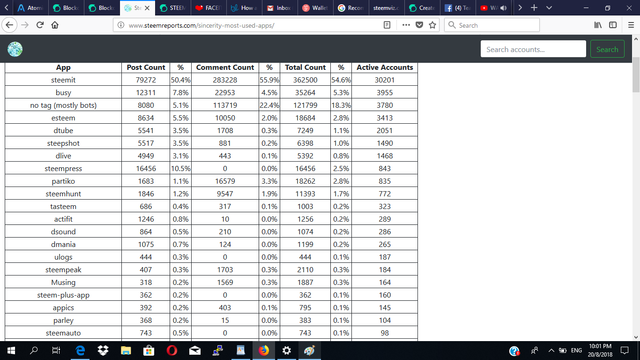 We haven't announced the use of the website yet but you will also notice that it is already among the top 15 most-used sites on steem. This is a good sign and incentive for us to push even more and not tire out now. We will incentivize "everyone' to build their dreams on the steem blockchain, starting with #ulog-based communities. Then, we will extend this, tp all existing communities worldwide. In due time, we will make public a whole team and proceed from there. Now, it is time to lay the ground right and begin to create awareness by means of videos etc. We will also apply a budget for conventional Ads as well on every social front; then look to arrange at least one physical event this year, perhaps, a Uloggers' party or some reality show etc to promote steem in the real world. We need to end the year strong. Many things aren't entirely clear but each day, things get clearer. Things will never attain perfection; thus, we will not be waiting for perfection. We will run things un(dis)talentedly even now. There is alot to do and we will do these things, however gradual. Overall, we want to pace things, perpetrating a global movement that is truly truly loved. We would like the teardrops SMT to be loved alike, thus, "gradual isn't that bad. Notice that the route and curriculum involving the Teardrops SMT started from before "steemit" as is evident in my introductory post. Bottomline is, we will not tire out and UloggersTV and TeardropsTV are timely endeavor to make sure "tiring out" isn't the case. With these TV(s), we can incite #ulogging and #teardrops fun-activities based off of renown trends, adjusting the very world with our shine, even now. Then, we will use our very shine to beautify blockchain technology. These things we can still do in our "very tired times". So, do you want to contribute a fun video to UloggerTV and TeardropsTV today? You so can! I may be wrong about that, but I think that Teardrops came about as a matter of the SMT. 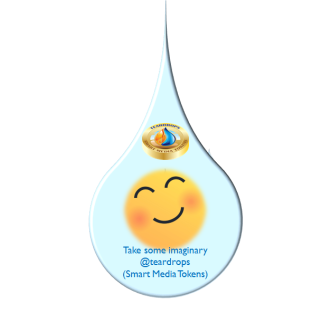 This TEARDROPSTV is another step towards making our community bigger by attracting more people and increasingly valuing the steem currency. Thank you for posting and Good morning!!!! @surpassinggoogle, I hope that you had an awesome haircut. And good luck for your Interview and hope that it will be fun and at the same time productive too. Yes, when we always stay Enthusiastic towards learning then for sure we will going to learn more and more, in some cases people think that they know enough then inturn it makes them limited minded. And great to hear that you are pushing hard to promote Steem. And for sure Steem Economy and ULOG Economy should get the needed recognition and boost and i want to wish that it will going to happen soon. For sure this post is telling that now the actions will going to take the pace, and in my opinion this pace is needed because, now it sounds and reflects as everything is falling at right place so we have to take the opportunity. It's nice to see that we are all growing and improving. Some faster than the others but we all get there in our own time. I think I have done most except the telegram because I still don't understand why I can't get on maybe when things are less hectic and have quieted down. Congratulations Sir Terry and goodluck! Cheers! Congratulation sir @surpassinggoogle wow! A TeardropsTV and a UloggersTV sounds more excitement and fun to discover and explore with these two awesome sites. I hope i can contribute something to be apart of it 😊. Haha im too shy to be on a video bro Terry 😂. I continue to marvel at your determination. You always have a desire to try something new. This desire is very rare nowadays. Good luck to you and Love. Я продолжаю удивляться Вашей решительности. У Вас постоянно присуще желания пробовать что-то новое. Это желания большая редкость в наше время. Удачи Вам и Любви. I would so love to see you in a new hair cut. I hope to join back in. So I'll do a Ulog video soon but what do I say in 8 seconds? I hope the Uloggers party will be held in Nigeria? Because I need to attend o. Despite some difficulties in life, you still manage to come up with brilliant ideas that we steemians can joined in. Thanks @surpassinggoogle and looking forward to your new haircut brother. @surpassinggoole, this contest go make sense but as i no fine now , people go see my ugly face lol, baba you be fine boss na, you know. You are funny. Fine is old school. I missed it. You mean my intro post? One day, I wanna make a game. Or just troll people. Like search their names in the search box and that will query all their old posts, I will dig to the oldest post of the corniest and cheesiest post they ever made and comment: "OH MY GOD, I can't believe you actually wrote this!" Or just say something nasty like, "Gosh, did you really make a sad poem about your ex?! LOL" Hahahahaha! Just for fun. Awesome!!! Good luck on your video creation journey @surpassinggoogle! There are so many great things ahead and I am excited for it! I wish you had the haircut before the show yesterday, nonetheless, thanks for gracing the show, I got some good comments in my WhatsApp and discord inbox. ...then look to arrange at least one physical event this year, perhaps, a Uloggers' party or some reality show etc to promote steem in the real world. Looking forward to this... A reality show is definitely something that intrigues people, I'm sure it will go a long way in promoting what this is all about to more people from all over. Keep up the great work, you are truly inspiring. Hahaha haircut will likely be same as the picture you used. Thank you though. Still, I'd like to see, same haircut but a different day. You've definitely grown some since those pictures of you. @surpassinggoogle I've been looking at your blog for a long time. I'll upvote your post every time. Your post gets a lot of information from which I like your post. Wao welldone work Surpassinggoogle...i totally appriciate your hard work...i will subcribe you on youtube...best of luck for your youtube channel....excellent invitations for peoples...i am a big fan of you sir..your every post are so informative....thanks for sharing dear. Truly this is one of a great innovation of yours @surpassinggoogle! Thank you for letting us show the celebrity in us. We will support you always! @surpassinggoogle I love your initiatives ! because I do not have to be an expert to express what I am feeling. This is very beautiful. It is easy to love you because you are very generous and really kind. You have made me see the blockchain in a more fresh and gentle way. Thank you very much for that. I will continue writing Ulogs. A big hug for you and thank you very much for sharing and being as you are! You will be interviewed sir? Another help you have to help the community and us steemians. Thank you for that @surpassinggoogle, for not letting go of us. I have seen how you have grown little by little and how we have grown with you. By the hand, as a good father carries his children. The new initiatives they have had and the new tools they have implemented have not only made communication between you and us more direct, they have also been a step forward for the new groups that are making their way. As I always say to you: Your support is returned in full for us. Have a good start to the week. Waiting for the new haircut, Terry! You created many platforms for steemians , this is great achievement of you . Keep it up dear Terry . 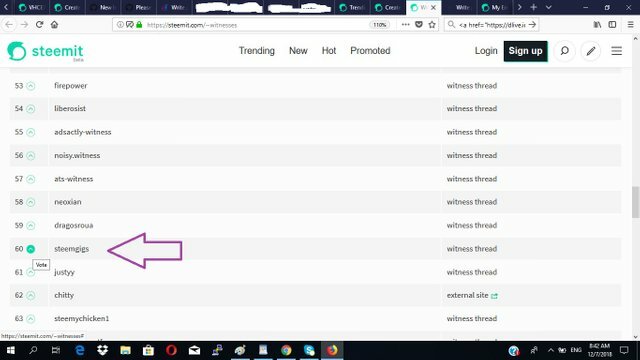 congratulations @surpassinggoogle because you can see the growth and development in everything you have undertaken with ulog, especially in your outstanding contribution to the entire steemit community! God bless you! This is good info to me.thank to @surpassinggoogle to atention. I xant imagine steemit without you and also can't imagine steemit with people like you only. Thanks for being there for us. Waoh, your tireless effort to make sure steemit becomes blockchain for all amazes me with numerous ideas you're putting into it. I just reached a 1000 followers and am thankful to God for it and the whole steemit community. Thanks to you too, you once said in a discord show two months ago on a Saturday that "each Steemians shouldn't look at others as achieving more than them, each has his own race,". I'll keep steeming on. Am happy I found someone who can inspire me here. I do get my haircut once in a month. Wow as I read this morning I was amaze and more exciting after I read this post sir @surpassinggoogle was made my day more interesting. The smt and teardops have a tv series which is more and more interesting to us. @surpassinggoogle his brainchid is very long wide minds I am salute you terry you are the best of the best person weve ever meet. Thank you keep going you have us to support your every projects ..you are celebrety and we are your funs. Congratulations guys, this information looks very good! I already subscribe to ullogers TV channel and I am excited to know the latest update about ulog community.. I follow your youtube, thank you. You are making addicted for people like me to check your steemit status regularly. I have became the 326th liker of facebook page, 69th Subscriber of UloggersTV and 6th subscriber of TeardropsTV. Always support your work. Cheers Terry !